It’s hard now to imagine a time when music was performed exclusively by men in neat suits and women in polite dresses. Working musicians during the early 20th century were expected to maintain a professional appearance not unlike their contemporaries in more formal business. Today’s popular music emanates from wild personalities in bombastic costumes amid elaborate stage productions. That turning point in our music history was David Bowie — who died yesterday at 69 after battling cancer for 18 months. Bowie was not only a prolific songwriter, who released 28 studio albums over 48 years, but also a genius of visual art. The stage personas he created were striking and dynamic aesthetic compliments to an unforgettable voice, imbuing an otherworldly aura unto music that already stood on its own. 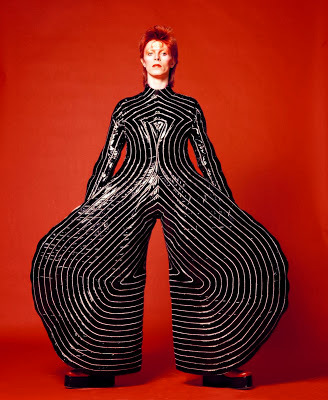 More so than any musician before or after, David Bowie was an Icon of Design. Born David Robert Jones in Brixton, South London in 1947, the young musician failed to establish footing in the burgeoning industry for much of the mid-1960s, releasing novelty singles such as “The Laughing Gnome” to little success. His stage name, Davy Jones, was also confusingly the very same as the lead singer of popular group The Monkees. Frustrated with his career, he began to reinvent himself, changing his stage name to David Bowie (in honor the knife-wielding American frontiersman) and developing a more impactful look and manner-of-dress. Bowie was designing his future in music. From that point on, it was impossible to consider his music without acknowledging its visual elements. The forlorn astronaut Major Tom in Space Oddity; the floral dresses and forward androgyny of The Man Who Sold The World and Hunky Dory; the red hair and silver countenance of alien-from-Mars Ziggy Stardust; the red-and-blue lightning bolt across the face of Aladdin Sane; Diamond Dogs’ dystopian anthropomorphic Halloween Jack; the emaciated soul of The Thin White Duke; the tortured pantomime Pierrot; Jareth the Goblin King — and countless other twisted acting roles. These images are as ingrained in western pop culture as any of his four decades of hit singles. Great design occasionally rears its head in the most unlikely places. Often it manifests in corporate logos, brochure layouts, and advertisements — but every once in a while it’s a menacing circle painted upon the forehead of a cherished rock and roll singer. Thank you for the generations of smiles and inspiration.